For the prediction of a specific year the majority of astrologers use Varshphal chart along with birth chart Dasha & Transit. Leostar Varshphal software solves that purpose. This software is based on Tajik system. Parashari, Jaimini and Tajik are the three most popular systems of Vedic Astrology. Parashar gives more importance to the planets while Jaimini considers the Rashis to be more important. Tajik is mainly used in Prashna Shastra and in Varshphal. Tajik system always diverts from the main stream of traditional methods and applies new techniques of Astrology. Apart from Varshphal calculations and predictions it also contains comprehensive and complete astrology solutions required by an astrologer for making predictions in its Astrology module i.e. planet aspect, Bhava aspect, cusp aspect, Saptvargas, Shodash Vargas, Varga Bhedas, Vimsopaka, Satvargas, Shodash Vargas, Varga Bhedas, Vimsopaka, Karaka, Avastha, Rashmi, Nakshatra Reading, Mahadasha and Antardasha analysis and Transit predictions for next 30 years, More than 500 astrological combinations, transits till 9999, the combinations and remedial measures for inauspicious Yogas like Manglik dosh, Kaalsarpa Yoga and Sadesati etc. have also been given in detail. 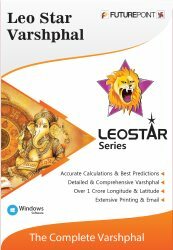 The modules that one gets in Leostar Varshphal software are Teva, Astrology, Varshphal, Tables & Mundane. Varshphal software can calculate Varshphal Horoscope Charts - Lagna chart, Moon chart, Hora chart, Dreshkana chart, Chaturthansh, Panchmaansh, Shashtyansh, Saptmansh, Ashtmansh, Navmansh, Dashmaansh, Ekadshansh, Dwadshansh, Triptaki charts etc. including Varshphal Dashas - Patyansh, Mudda and Vimshotri Dasha accurately. It also gives Muntha, Munthesh, Varsesh and Varshlagnesh predictions. In Varshphal software we get details like planetary degrees, birth details, all kinds of strengths of planets, Pancwargeeya Bala, Maitri Dwadash Vargas, Harsha Bala & Dwadashvargeey Balas have been shown. Calculation of Varshesh, Sahams of 60 types, three types of Dashass – Patyansh, Vimshotri Dasha and Mudda Dasha including five level calculations. Prediction of Varshphal on the basis of Muntha, Munthesh, Varshesh and Varsh Lagnesh, Sixteen Yogas of Varshphal (Tajik Yogas) with the information of presence and absence of these yogas. Varshphal of any year can be made. Yearly calculation on traditional, Sayan and Nirayan system, exact sun degree system. Varshphal Yogas - All Varshphal Yogas are included in this Software like Ikkbal, Induwar, Itthshal, Israf, Nakta, Yamaya, Manau, Kambul, Gary Kambul, Khallasar, Radd yoga, Dufali Kutth Yoga, Dutth Kutthir, Tumbir, Kutth, Duraf yoga etc. Astrograph - health, financial situation, mental state, graphical analysis on daily, weekly, monthly, yearly, and 10-year basis available.